The Bowers family first appear for definite, in the fenland village of Wicken, in the county of Cambridgeshire, United Kingdom on 27th October 1832. This first appearance saw my 4x Great Grandparents, Henry Bowers and Ann Bailey at St. Lawrence's Church at the East end of the village. Their marriage is followed by an entry in the baptism register of their daughter Emily Bowers in the following February of 1833. There are a further six more of their children recorded in the registers - the last being in 1855 - my 3x Great Grandmother - Ann Bailey Bowers. She is noted as being 12 years old when she was finally baptised. By this time, her father Henry Bowers had come to an untimely end due to tuberculosis at the age of 35 and her mother had re-married. Despite there being many Bowers surname-holders in nearby Burwell, and Horseheath (further away, but also in Cambridgeshire), there is no clear evidence for Henry's baptism. The only clue for earlier Bowers relatives is a death card from September 1889, for a John Bowers of Burwell, which was amongst some Bowers family papers. 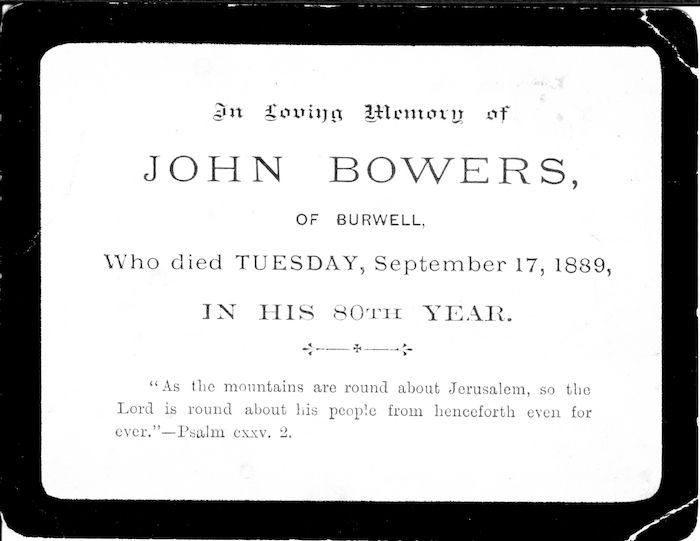 Above: Death card for the mystery John Bowers of Burwell, September 1889. Photo: Andrew Martin. The date of birth suggests that this John Bowers might have been a brother to my Henry Bowers (and therefore an uncle to my ancestors) - giving a good reason for the death card to be amongst the Bowers family papers. His death certificate reveals the name of his daughter, Emily Bowers, later Emily Fuller, as the informant, but a clear link remains elusive. By the time of the 1881 census in Wicken, Ann's mother appears with her second husband, Jackson Layton, where they are living in Burwell, Cambridgeshire at Guinea Hall. Her daughter Ann was married to James Simpson Bishop and was living in Wicken High Street with 10 of their eventual 15 children. Ann's sister, Sarah Bowers married George Farby of Little Thetford but the couple did not have any children of their own. When Ann (Bowers) died, it left her husband James Simpson Bishop with a young family. Sarah and her husband helped to look after the children and earned themselves the affectionate title of Grandad and Granny Farby. My 3x Great Grandmother's older siblings, Emily (now Emily Cropley) emigrated to New South Wales, Australia, and she is noted as assisting her younger brother Maurice Bowers in emigrating to Australia in 1857. Maurice arrived aged 17 and penniless, but soon took work and eventually grew a butchery business that saw him own a number of butcher's shops and land. When he was 70 years old he became the Mayor of Ipswich in Queensland, Australia for a term of office running 1910-1911.